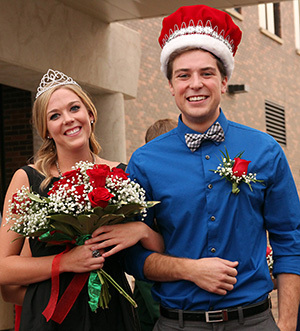 Minot State University students selected Alex Buchholz and Reagan VanTeeling as the 2015 Homecoming king and queen Sept. 15. Buchholz, a Minot native, is majoring in biology and chemistry. He represented Residence Hall Association. VanTeeling, from Brandon, Manitoba, is majoring in communication disorders and represented National Student Speech Language and Hearing Association. Other members of the Homecoming court (with hometown and student organization) are Katie Abrahamson, Minot, Campus Players; Madison Arnold, Paradise, Calif., POWER Center; Breanna Benson, Minot, Sigma Delta Sorority; Kelsey MacNaughton Buchholz, Brandon, Manitoba, RHA; Kelsey Busch, Columbus, Beta Theta Sorority; Joel Cartwright, Great Falls, Mont., Student Government Association; Alex Cundiff, Williston, Minot State Club of Physical Educators; Nikki Egge, Williston, MSU Life; Jason Gaarder, Minot, Campus Players; Abigail Graves, Staples, Minn., Student Ambassadors; Ismail Hassan, Minot, Honors Program; Madison Irmen, Minot, MSCOPE; Kristopher Merrilln Tracy, Calif., MSU Life; Skyler Niebuhr, Sawyer, SGA; and Quinn Williams, Farmington, N.M., POWER Center. 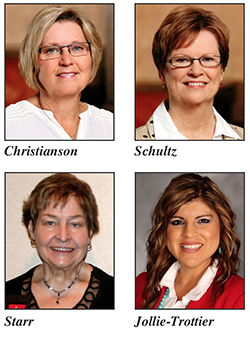 Linda (Wagner) Christianson, Deb (David) Schultz and Sandy (Schjeldahl) Starr received the Minot State University Alumni Association’s Golden Award Sept. 17. Dr. Tami Jollie-Trottier received the Young Alumni Achievement Award. The highest award bestowed by the MSU Alumni Association, the Golden Award selections are based on outstanding service to the university or alumni association and distinguished leadership in the recipient’s career or community. The Young Alumni Achievement Award recipient is between the ages of 21 to 39. Christianson, retired educator, graduated from MSU in 1972 with a Bachelor of Science in Education. After teaching at Harrison School and Minot Air Force Base, she transferred to Edison Elementary School, where she taught third and fifth grades. Following retirement from teaching, she served as a consultant for book publisher Houghton Mifflin Harcourt for four years. “I am a very proud graduate of Minot State University and attribute my successful career to my learning and experiences there,” Christianson said. Schultz, graduated from MSU in 1973 with a Bachelor of Science in physical education but continued her studies to acquire an elementary education endorsement, a certificate for working with gifted and talented children and ultimately a Master of Science in elementary education in 1989. After teaching at Berthold Public Schools and Dakota, Sunnyside and Lincoln elementary schools, she retired as the assistant principal at Lincoln Elementary School in 2007. She substitute taught until 2014. Together, Christianson and Schultz co-chaired the MSU Gala, the Alumni Association’s major fundraiser, for three years. Then, they served as Alumni Association co-presidents from 2010 to 2012. As students, both women were active in Greek life on campus through the Sigma Sigma Sigma Sorority; they co-chaired the Tri Sigma Alumnae Chapter, with its reunion in 2012. Both were also involved with the revival of the Sigma Sigma Sigma Sorority as the Sigma Delta Sorority. Starr, who retired as an assistant professor of music education, taught for 41 years in MSU’s Division of Music and at the former University Laboratory School. She chaired the music division from 2005 to 2008 after being interim chair in 2000-2001. She founded and was musical director of Western Plains Children’s Choir, which was the official Governor’s Chorus in 1996-97. Starr directed Minot Chamber Chorale from 1989 to1995 and sang in the group from 1972 until 2002. She presently serves on the Chorale board of directors. She taught music education and supervised more than three decades of student teachers. She was awarded the Faculty Achievement Award in 1998. She has been awarded several faculty grants and listed numerous times in “Who’s Who of American Women.” In March 2010, she was inducted into the North Dakota Music Education Association’s Hall of Fame. She received the YWCA Women of Distinction- Lifetime Achievement Award in 2014. Jollie-Trottier, an enrolled member of the Turtle Mountain Band of Chippewa, is a clinical psychologist working on her home reservation in Belcourt. She received her bachelor’s degree in psychology from MSU in 1999. She actively participated in the Native American Cultural Awareness Club and continues her relationship with MSU and NACAC through presenting and providing workshops. In 2005, Jollie-Trottier earned her doctorate in clinical psychology from the University of North Dakota. She then completed a two-year fellowship in health psychology research at UND School of Medicine; and one year of specialty training at the Eating Disorder and Neuropsychiatric Research Institutes in Fargo. She has provided clinical services for Indian Health Services, Behavioral Health, since 2008. Possessing the spirit name of Red Wind Woman, she blends together her passion for living a healthy lifestyle with her educational, cultural and spiritual knowledge, personalizing her approach to therapy and wellness. “I am honored to provide services to my people and plan to continue on a journey to personal wellness and to promote healing and wellness for others,” Jollie-Trottier said. NOTSTOCK is back with new and exciting opportunities for guests to participate in the arts. Wednesday through Saturday (Sept. 23-26), Minot State University’s annual live, signature arts festival, NOTSTOCK 2015, celebrates four days of printmaking, poetry, music, ceramics, theatre, dance, foreign language and communication arts and features two special art exhibits. Most events take place on MSU’s campus and all are free of charge. “This unique participatory all hands-in, all hands-on arts event continues to grow in popularity attracting talent locally, regionally and nationally,” said Bill Harbort, art professor and NOTSTOCK co-organizer. WordStock kicks off the event with award-winning poet, Jason McCall. He will perform his work Wednesday (Sept. 23) at 7 p.m. in Aleshire Theater with a reception to follow. Then, he will conduct workshops in the Conference Center Thursday and Friday (Sept. 24-25) and host a Poetry Slam in the Beaver Dam on Friday (Sept. 25) at 1 p.m.
“The vibe for the Slam in the Dam! manages to be genuine, powerful, and fun all at once! Performers and audience alike really get into it!” ShaunAnne Tangney, English professor and WordStock co-organizer, exclaimed. Relief printing method will be showcased at NOTSTOCK 2015 for the first time. Eric Woods, artist, printer and founder of The Firecracker Press of St. Louis, as well as Briana Kagy, will print using an antique poster press and woodcuts live in the Beaver Dam Thursday through Saturday (Sept. 24-26). The Firecracker Press describes itself as “a letterpress design studio that combines antique printing technology with modern thinking to produce objects that bring surprise and joy.” The Firecracker Press will give a presentation Thursday and Friday (Sept. 24 and 25) at noon in Aleshire Theater. The works will be for sale during NOTSTOCK and displayed at 62 Doors Gallery and Studios, downtown Minot. PotStock opens its sixth year with guest ceramicists Alexandra Jelleberg and Kendra Rodgers. Jelleberg and Rodgers and MSU faculty and students will give ceramics demonstrations, including raku firings, Thursday and Friday (Sept. 24-25), 9 a.m.-4 p.m. and Saturday (Sept. 26), 10 a.m. to 3 p.m., outside the north entrance to the Student Center. Any student or visitor can sit at a potter’s wheel and attempt to throw a vessel with direction from PotStock guests. Jelleberg will give a presentation of her work Thursday (Sept. 24) at 10 a.m. in Aleshire Theater. “Icons,” a traveling exhibit of photographs from the North Dakota Museum of Art, will be on display in the Conference Center. The exhibit is free and open to the public Thursday and Friday (Sept. 24-25), 9 a.m. to 4 p.m., and Saturday (Sept. 26), 10 a.m. to 3 p.m.
Theatre goes all out in its fourth year. Special guests, Bearded Men Improv, return to MSU and will host improv workshops Thursday (Sept. 24) from 1 to 2 p.m. and again on Friday (Sept. 25) from 10:30 to 11:30 a.m. and 1 to 2 p.m. in Aleshire Theater. On Thursday (Sept. 24), the group will perform its intelligent, clever and flat-out hilarious show in Aleshire Theater at 8 p.m.
Again this year, Jean-Francois Mondon, assistant professor of German and Latin, is presenting a foreign language writing workshop. Participants will explore the basics of Egyptian hieroglyphics, Chinese, Japanese and Russian writing systems and learn to decipher the mechanics in a fun, creative way. Mondon’s workshop is Thursday (Sept. 24) from 11:15 a.m. to noon in the Conference Center. Also again this year, KMSU and the Broadcasting Program will offer students the opportunity to be on live radio and let them unleash their inner broadcaster. Friends and family can listen to live interviews with guests on channel 19 on Thursday and Friday (Sept. 24-25), 10 a.m. to noon. Visit KMSU 19 on Facebook for more information! Daily do-it-yourself screen printing, a favorite NOTSTOCK activity, continues in the Beaver Dam Thursday and Friday (Sept. 24-25) from 9 a.m. to 5 p.m. and Saturday (Sept. 26) from 10 a.m. to 3 p.m. Visitors can choose a NOTSTOCK design and “pull” their own screen print. Participants are encouraged to bring their own T-shirts, hoodie, tote bag or other item to be printed or buy a T-shirt from MSU Art Club. Local bands will also play daily during the event. Finally, NOTSTOCK will host musician Kaïa Kater. One of the youngest performers in the Canadian old-time and folk communities, this 21-year-old plays the banjo, sings and has her own unique take on Appalachian and Canadian folk music. Kater is an eclectic traditionalist, having quickly gained attention as one of the most promising young performers in the North American folk world. She will perform Friday (Sept. 25) in Aleshire Theater. Wild Hands opens the show at 7:30 p.m., and Kater takes the stage at 8:30 p.m.
New this year is a dance workshop. Kater will lead “Percussive Dance Traditions of Southern Appalachia: A Journey in Hambone and Flatfooting” Saturday (Sept. 26) in Ann Nicole Nelson Hall from 11:00 a.m. to noon. NOTSTOCK closes with a reception at 62 Doors Gallery and Studios Saturday (Sept. 26), 7 p.m. Attendees will enjoy art, food and music with this year’s guests. For a complete list of times and events, visit www.msunotstock.org. All events and performances are free and open to the public. Minot State University’s Campus Players presents the 24-Hour Play Festival performance in the Aleshire Theater Saturday evening (Sept. 26) at 7:30 p.m.; doors open at 7 p.m. The 24-Hour Play Festival is a dynamic, whirlwind theatre event. Beginning with a meeting with actors, playwrights, directors and producers, each pitching in one prop and one costume piece on Friday (Sept. 25) at 7 p.m., the event launches into true creative mode. The playwrights get to work on frantically writing 10-minute plays based on the actors, props, costume pieces, along with some fun and challenging parameters that change every year. The following morning, actors are handed their scripts, assigned to directors and dive into intensive rehearsals, culminating in a live performance for the public at 7:30 p.m.
Campus Players is the oldest student-run organization at MSU. For over 90 years, Campus Players have played a vital role in the enhancement, study and enjoyment of theatre through participation and engagement on campus, in the community and beyond. There are no advanced reservations for the performance. General admission is $3. For questions, contact the Aleshire Ticket Box Office at 858-3172. The Minot Symphony Orchestra will welcome Efraín Amaya, its new conductor, Oct. 6 with a “Meet the Maestro” open house in the Conference Center (Student Center, third floor), from 5 to 7 p.m. With this open house, the community can meet Amaya prior to “Scandinavian Celebration,” the concert which will open MSO’s 90th season Oct. 10 in Ann Nicole Nelson Hall at 7:30 p.m.
Amaya, American conductor, composer and pianist, brings a wealth of talent and experience to MSU with distinct international credentials. He was most recently the founder and conductor of the Pennsylvania-based Point Chamber Orchestra, which he led in concert tour throughout Italy. Prior to that, he was the resident orchestra conductor at the prestigious Carnegie Mellon University, the Greensburg American Opera and the Westmoreland Symphony Orchestra, among others. His work as a conductor ranges from contemporary music ensembles to youth orchestras. 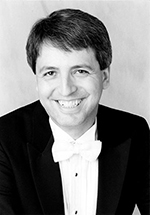 Amaya’s compositions have been performed at major international festivals from Seattle to his home country of Venezuela. With scores of compositions to his credit, his works have been recorded and performed by a long list orchestras, ensembles and artists. A cursory YouTube search will bring up a lengthy representation of performances of his operas, orchestral and chamber music as well as his own performances as both conductor and pianist. Amaya began his musical training in Venezuela and continued his studies in the U.S., earning two bachelor’s degrees in composition and piano from Indiana University and a master’s degree in orchestra conducting from Rice University, Houston. For questions, contact minotsymphony@minotstateu.edu or 858-4228. Minot State University and the University of Social Science and Humanities, Poland, are partnering to offer exchange programs, study abroad programs, dual diplomas and faculty exchanges. 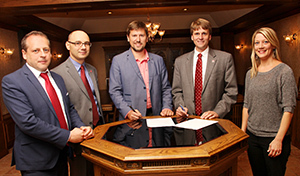 A Memorandum of Understanding was signed Sept. 16, forming the basis for the future cooperation between the universities. “We are looking forward to this cooperation and believe that this mutually beneficial partnership will lead to new opportunities for the academics and students,” said Jacek Mrozik, College of Business dean. The Polish counterpart was represented by Pawel Kowalski, director of international relations, and Artur Wroblewski, professor of business administration, who spent time with each MSU college and participated in some Homecoming festivities. SWPS is a private university created after the fall of communism in Eastern Europe. The university’s main campus is located in Warsaw with four additional campuses located in other Polish cities and is comprised of 14,000 students. It is a leading institution in the area of psychology and the largest private university in Poland. For questions, contact Mrozik at jacek.mrozik@minotstateu.edu or 858-3110. Pictured are, left to right, Artur Wroblewski, Jacek Mrozik, Pawel Kowalski, Steven Shirley and Libby Claerbout. The North Dakota Center for Persons with Disabilities, a Center of Excellence at Minot State University, has been awarded a three-year cooperative agreement through the Centers for Medicare and Medicaid to assist North Dakotans in accessing health insurance through the Affordable Care Act. Neil Scharpe, project director, indicated the project will build on the collaborative network of regional navigators and certified application counselors that was established in the first two years of the Navigator Project. The Navigator partners include Family Voices of North Dakota, Federation for Families of Children’s Mental Health and DLN Consulting, three community-based programs. The network will offer N.D. consumers regionally based certified navigators to assist them in accessing and re-enrolling in qualified health plans through the Marketplace and also assist with enrollment in Medicaid Expansion and Healthy Steps, the children’s health insurance program. NDCPD was awarded $323,048 annually over the next three years to accomplish the goals of this project. For questions, contact Scharpe at neil.scharpe@minotstateu.edu. Minot State University welcomes new employees, Hasan Buker, Artesa “Tracey” Mays and Doug Pfliger. Buker has returned to MSU as an associate professor of criminal justice. He earned his doctorate in criminal justice from Washington State University in 2007. He taught at WSU and MSU from 2005 to 2007 and moved to Turkey, where he taught for four different universities between 2007 and 2015. He has prior experience of working as an administrator for the Turkish National Police for eight years. He authored, edited and co-edited 19 books and book chapters and published numerous journal articles, reports and policy papers on his areas of expertise. He is married and father of three children. Mays has joined the business administration faculty in the College of Business. She previously taught at Webster University in Washington, D.C., and she holds a bachelor’s degree from Florida State University and a master’s degree in human relations from the University of Oklahoma. Her husband, Jamal, is in the U.S. Air Force, and the couple has a son. The family enjoys traveling and participating in sports and outside activities. Pfliger is also returning to Minot State as a faculty member in the Division of Humanities. He earned a Bachelor of Science in Education from MSU and a Master of Fine Arts from the University of North Dakota. He is the gallery manager at the Taube Museum of Art, Minot. Sept. 23-Oct. 2 — "Americas 2015: All Media," a national juried exhibition with guest juror Richard Notkin of Vaughn, Wash., Hartnett Gallery. Tom Seymour, business information technology professor, Kristi Berg, business information technology associate professor, and Jasmine Zakir, graduate student, had the article, “Big Data Analytics,” published in Issues in Information Systems Journal, International Association for Computer Information Systems Annual Conference, Clearwater Beach, Fla., in October 2015. The article can be viewed at http://www.iacis.org/iis/2015/2_iis_2015_81-90.pdf. Minot State University is first and foremost dedicated to the success of all students: their growth and development as educated citizens, their confidence, and their life-long devotion to the common good and the welfare of others.